The Ridge Corsair lies near the northern edge of Karamadoo Bay, near Sisngabang Mountain on Babeldaob. This Corsair impacted into the side of a steep hill and created a debris field, which, for the most part lies on a ridge with some scattered debris spread to the south and west below in the mangrove swamp. 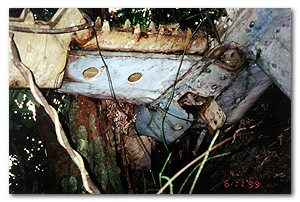 The almost intact empennage lay precariously nestled between a giant tree and the face of this steep hill, rotated 90 degrees around the fuselage axis, with the top of the vertical stabilizer facing outward from the hillside. As the tail section was one of the locations for aircraft identification numbers, I crawled out on the vertical stabilizer (now horizontal), swept away the jungle debris but did not see any numbers immediately. I could make out "NAVY". Further yet up the hill, the debris field became clearer: most of the wreckage appeared to lie in a 40-yard radius, facing up the hill (eastward) from the base of the empennage. To the left and up the hill from the empennage, lay 1) part of the cockpit firewall with a tube on which was printed "Fresh Air", 2) the outward tip of the starboard aileron, and 3) the starboard wing heavily overgrown by jungle. To the right, Lazarus discovered the Pratt & Whitney R2800 engine (Picture 22), lying impacted in the hillside with the Hamilton Standard propeller blades bent back around the engine. Just below the engine, we found small pieces of the plastic canopy and parts of both landing gear assemblies. There was no evidence found of human remains. Analysis of the debris field seems to indicate that the aviator was flying in a north to northeasterly direction and impacted into the hillside at high speed, not far from Sisngabang Mountain. If there was an explosion (and there must have been), it must have been snuffed out almost immediately, as there was no evidence of fire damage found. The fuselage (including the tail section) appears to have been thrown further to the north after initial impact up the hill with only a small amount of debris being blown down the hill (south and west) for almost a hundred yards of impact. This would explain why we saw debris as we approached the base of the hill from the south. After looking at my photographs, I discovered that there was in fact a Bureau Number of the vertical stabilizer that I had missed in the filtered jungle light. The number was "14241" which belonged to First Lieutenant Kenneth A. Wallace, USMCR of VMF-114, who was killed in action 3 March 1945 (the day before Major Stout, his squadron commander was killed). From the official after action report from that mission, Lt. Wallace had requested permission to strafe some camouflaged boats near the shore of Karamadoo Bay. 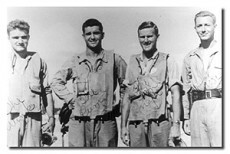 His flight leader, Major Oelrich, after giving the go ahead, then saw Lt. Wallace's plane make a low strafing run and then "crash into the ground about 100 yards north of the target (note: about where Lazarus pulled up his small fishing boat for us) and cut a path through the undergrowth." According to a later report, on 20 April 1947, Mr. Ngiringas, who was then Captain of the Koror Police, reported this crash site to US military authorities occupying Peleliu. On 25 April, a Search and Recovery Team found at this site approximately 90 bones (sufficient for identification), which were then interred, after notifying the family, in a military cemetery near Manila in the Philippines. Interestingly, that team did not report finding the aircraft identification (Bureau) number. 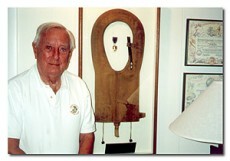 In his recent book describing his experiences as a Marine aviator in VMF114 ("Friends, Dear Friends, and Heroes," Freebooter Press, Springfield, MO, 1997), Bill Cantrell recounts that day, remembering Lt. Wallace as a "shy Scot with little to say, a ready smile and brave heart." 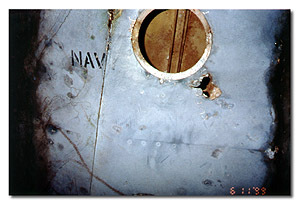 Lt. Wallace had been noted on previous missions to return with tree leaves in his gun ports, "irrefutable evidence that he was flying too low." Concerned that Lt. Wallace might have a problem with "target fixation," several squadron members had cautioned him about this. Whether or not that problem took him to his grave will never be known, but Bill noted that "He wiped out the gun position in the process."